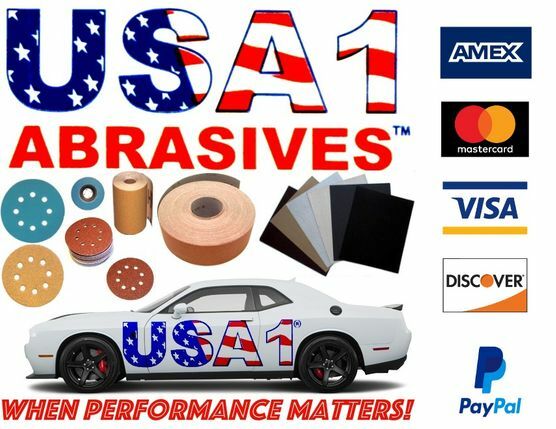 At Online Industrial Supply, we carry a full line of good quality, reasonably priced coated abrasive products! All of our products are manufactured exclusively in North America and Europe using the latest technology and according to the highest standards of quality. Our prices are the lowest you will find anywhere! We are proud to have a customer satisfaction rating of more than 98 percent! Payments are processed through Bank of America or PayPal, so your credit card information is always safe and secure and never stored on our servers. All orders are shipped promptly using Priority Mail or UPS Ground and tracking your order is easy. Orders placed by 2:00PM Eastern time are processed the same business day. Questions about our products? Please contact us at: sales@onlineindustrialsupply.com. ProStar Sandpaper Sheets, Aluminum Oxide, 9" by 11", 80 Grit, Pack of 50. 5" 8-Hole BlueCut Hook & Loop Sanding Discs, P220 Grit, Box of 100. GoldStar Sandpaper Sheets, 9" by 11", P100 Grit, Pack of 50. Solid BlackCarbon Wet/Dry Paper Hook and Loop Sanding Discs, 3" Diameter, P320 Grit, Box of 50. GoldStar Adhesive Sandpaper Roll, 4.5" Wide, 10 Yds. Long, 120 Grit.